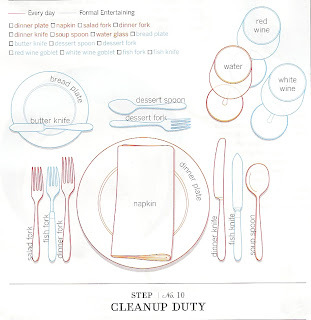 I have 'talked' here before about proper etiquette and of course showed you amazing tablescapes to keep your mouth watering so I thought it only fitting to discuss the proper way to set a table. Check out this diagram - now there is no excuse for putting the fork in the wrong place. Please feel free to share this info with your fiance - never too old to learn something. Even I have trouble remembering which is my bread plate - keep this trick handy (no pun intended) and you won't make a mistake next time!